Although the procedure to use the Arduino as an In-System Programmer is well-documented, I thought it would be an interesting project to make a stand-alone programmer instead of having to link wires between two Arduinos. Designing the programmer from scratch meant I could tailor it to suit my own needs and avoid any documented problems such as the auto-reset fitted to later Arduino boards. What follows is based on my own very limited experience with ATMEL microprocessors and will, no doubt, need modifying in the future in the light of additional knowledge. ATMEL have a comprehensive guide to their In-System Programming so what follows is a quick summary as I understand the system. The system uses the microprocessor's normal three-wire SPI bus (MOSI, MISO and SCK) to provide in-circuit programming by tri-stating (or, effectively, isolating from any other circuitry) all the chip's other IO pins during programming. This is achieved by holding the chip's RESET pin active (low) during the entire programming operation. The programmer acts as Master on the SPI bus, so the timing of holding the RESET pin low is most-easily achieved by the programmer. Therefore, in addition to the three SPI lines between the programmer and the "target" chip, a fourth line from the programmer is used to control the RESET pin. Thanks to work by David A. Mellis, Randall Bohn, Randall Bohn and others, in the Arduino environment, all this is taken care of for us with a sketch called ArduinoISP to be found in the Examples folder. As the target microprocessor and an In-System Programmer are usually physically separate entities, a fifth line (Ground) is also required between them. The ATMEL AVR guidelines allow flexibility in how the target chip is powered. In my programmer, both programmer and target chip are on the same printed circuit board. As the power comes from the PC's USB port, that power is used to supply both the programmer and the target chip. 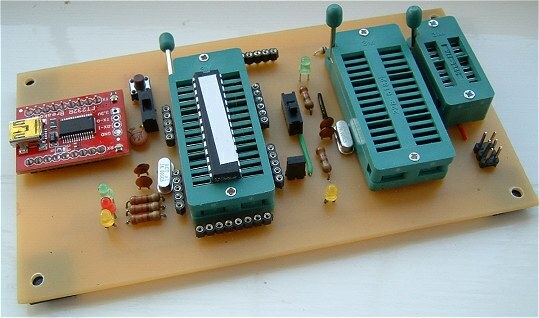 A PCB-mounted slide swich can disconnect power from the target chip, if required, without it being necessary to power-down the entire programmer. An outbound ISP header is provided on the programmer to enable it to be used as a "true" In-System Programmer. The header is 'outbound' in that the RESET connection (on header pin 5) is an outbound signal to the target's RESET input. 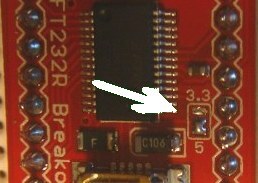 The FT232R USB to Serial converter supplies 5 volts to the Programmer from the computer's USB socket. There are several different USB to Serial converters available, all of which do more or less the same job. I've used the Sparkfun Breakout Board for FT232RL for this project but it was necessary to desolder the 3.3 volt solder bridge and bridge the 5 volt pads instead. It's shown on the schematic but is a bit hard to spot unless you're aware of it. It's also necessary to solder the two 9-way male header strips to the board. The driver is available from the FTDI website although I found that allowing Windows to search the internet automatically successfully found, downloaded and installed the correct driver (in both XP and Windows 7). I've used a BV104 breakout board made by ByVac successfully in other projects so it really comes down to personal choice. The programmer uses an ATmega328 - as used in the Arduino Uno - mainly to avoid the chicken and egg situation often encountered when building a programmer. It's connected exactly as in a stand-alone circuit. 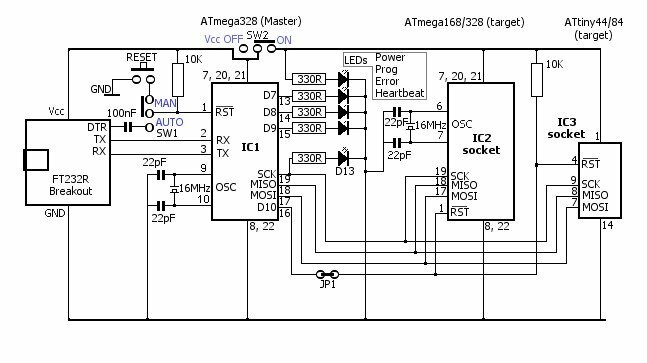 Although not actually required for use as a programmer, I've brought most of the ATmega328's IO pins out to female headers on the PCB to make the finished project as versatile as possible. For the same reason, I used a zero insertion force socket in both the master and the target IC locations. A fifth LED shows when switch SW2 is supplying power to the "target" sockets. Switch SW1 enables the Master's RESET to be controlled manually, with the PCB-mounted tactile push button switch, or automatically by using the DTR signal from the RS232R breakout board (The ByVac breakout board has a similar connection available). It's envisaged that the Master will require re-programming from time to time; for example, to run the Bootloader Sketch instead of ArduinoISP. Once the new sketch is in place, SW1 should be switched to the Manual position to prevent the ATmega328 resetting itself at inconvenient moments.